We use Royal Mail for smaller orders. Larger parcels may be sent using an alternative courier service. Orders received on Fridays / Saturdays / bank holidays dispatched next working day. 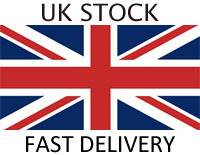 We will send you a confirmation email when your order has been dispatched.